In the Srivaishnava tradition, the Sanyasa asrama (the other three being brahmacharya, grihasta & vanaprasta) is considered as a very exalted stage of one’s life and is assigned to the later part of one’s life. It has been sanctified by Sri Yamuna, Sri Ramanuja and so on. 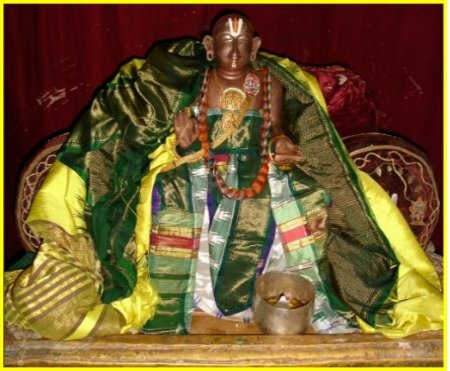 It is said that there were over 700 Sannyasis in Ramanuja’s entourage. 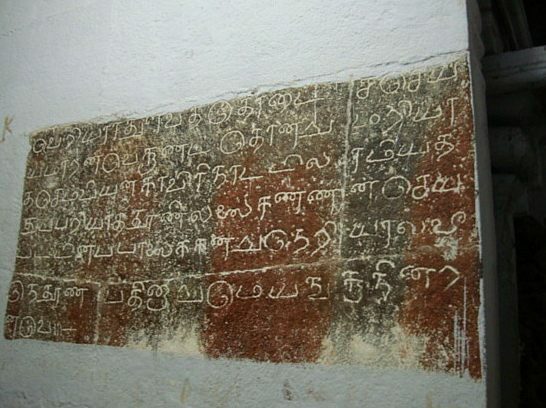 Ramanuja was so zealous to uphold the ideals of this asrama that he commissioned his disciple (former Advaita preceptor) Yadavaprakasa to write out a treatise on this subject called the Yatidharmasamucchaya. He is a sarvasangaparityaagi i.e. he abandons all earthly possessions father, mother, wife, son, daughter, house, riches etc. It is a total secession from domestic life followed by certain purificatory ceremonies as laid down in the sacred texts. Thereafter he becomes a bhikshu (beggar) living purely on alms, a parivrajaka (itinerant) wandering around homeless. 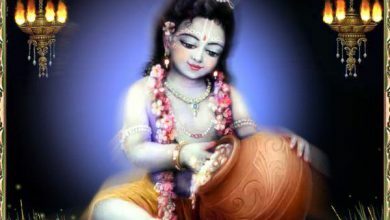 He is given to severe austerities and self-mortification and is concerned principally with restraint of senses and contemplation of the highest reality- Brahman. ‘A Sannyasi should always possess the following five things; yajnopavita (sacred thread), tridanda (holy staff), jalapavitra kaupina and kati vastra (the covering cloth)’. ‘The tridanda itself is vishnuroopa and has to be carried always’. A Panchratra text, Tattvasaagara Samhita lays down that the tridanda should be mentally divided into five parts and that the five vyuha forms of the Lord Vasudeva, Sankarshana, Pradyumna, Aniruddha and finally Lord Narayana are integrated into these five parts: paramesbyaatma, purusbautma, visvaatma, nivrittyaatma and sarvaatma are respectively their attributes. The ascetic should meditate on these five forms of Lord Vishnu and whenever the tridanda is placed down a mantra is uttered “Oh ground! May you become the sanctified place for this tridanda which envisages Lord Vishnu’s form”. 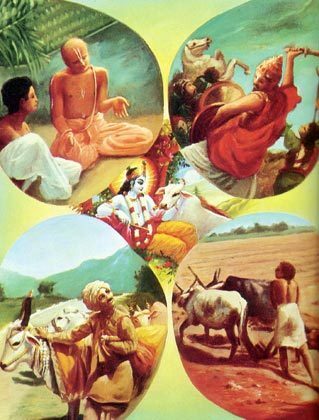 Hence whenever the tridandd is carried the following mantra is uttered sakha me gopaaya’. ‘Friend, protect me’. Can a mere achetana (inanimate) bamboo tridanda afford protection? Obviously no. It is the vishnusvaroopa (Lord) within it that protects. The shika (tuft) and yagnopavita (sacred thread) are essential for the Srivaishnava ascetics. A Sanyasi has to form saucha(purifactory rites) like brushing teeth, taking bath etc like a grihasta(householder) but three or four times as much. He is to beg for his food and should eat only once a day and a specific quantity. He should eat food not to satisfy himself but for his sustenance. He should bow to God and other elder ascetics of his order but he should not pay obeisance to a householder however exalted he maybe. 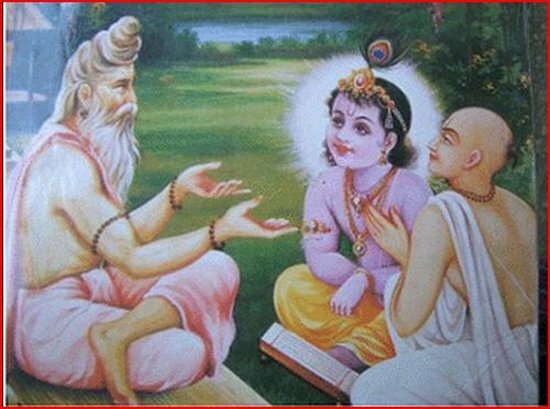 The ascetic is not to utter any benediction when a person bows to him, but should only utter the name of Lord Narayana. A tridandi according to Manu is one who has restraint over his speech, mind and body and does not imply mere physical appearance of carrying tridanda. ‘He should not mingle freely and should not speak in a flowery language that will attract people. He has to behave like a child, a dumb person’. When a Sannyasi dies he is to be buried in a pit and covered with salt. No mourning is to be observed and no ceremonies (sraaddha-s) are to be performed except paarvana on the eleventh day. The pontifical head (Mathadipati) is primarily an ascetic (yati) and in addition he is expected to perform administrative and social duties too. He has to perform five purificatory acts (pancha samskaara) for his disciples, receive acts of total surrender (bharanyaasa) from whomsoever so desires, propagate Sri Ramanuja’s philosophy by giving discourses and by holding meetings of learned scholars (vidvat sadas). Hence even though an ascetic should not acquire wealth, for the sake of the Math the spiritual leader is empowered to raise funds says the Parasara samhita. So the rules are very strict; the pontifical head should nurture vaishnava dharma, conduct daily worship of the Lord, expound, establish and elaborate upon the Vedanta-s through discourses. ‘Thou shall reside comfortably in this place. We are grateful to you and on our part we will serve you happily’. Thus saying, coconuts should be offered to the Sannyasi. After these preliminary rites, worship of the Lord should be performed by the ascetic. During the concluding function, after four pakshas have elapsed after the ascetic’s bath and daily duties, the remaining mud should be mixed with water and disposed off. 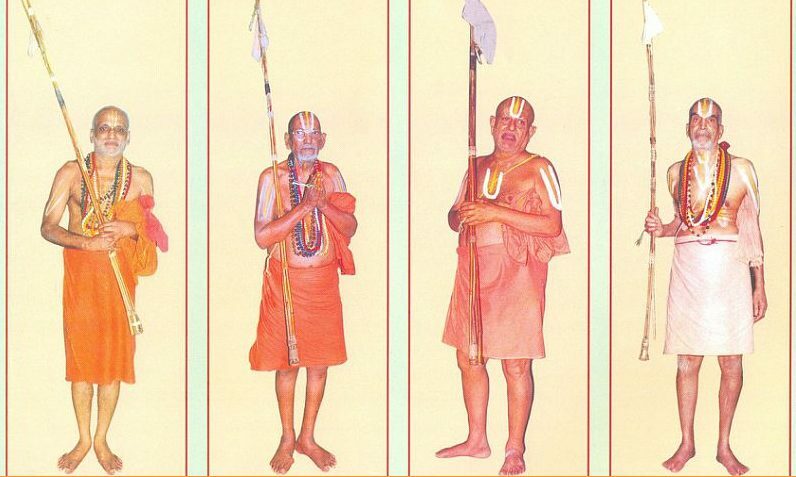 The jiyar-s of Sri Ahobila Math belong to theparama hamsa category and are carrying on this holy sannyasa tradition with great fervor, dedication and enthusiasm.